There are many body soaps that boast moisturizing ingredients in the world, but do you know that moisturizing ingredients are washed away after you rinse? 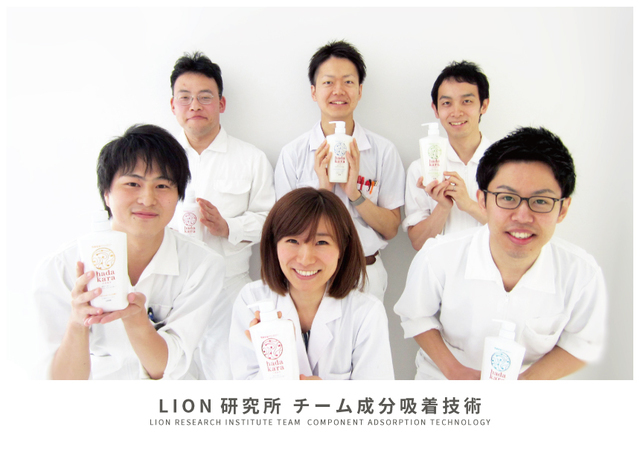 To solve this problem, in these three years, LION has developed a new technology to keep the ingredients on your skin: Absorption moisturizing technology "hadakara.” They are not merely moisturizing ingredients, but this technology can be combined by adding fragrances, bactericidal ingredients, anti-inflammatory ingredients, with various other effects. We are looking for new concept/design utilizing this technology. Did you know that body soap’s moisturizing effect is actually washed away?! A survey conducted by LION proves that 91% people suffer from dry skin, and can be considered as the “biggest skin problem of the year.” Asian race people like Japanese has thin layer of stratum corneum and low skin moisture level, so their skin is originally prone to dryness. 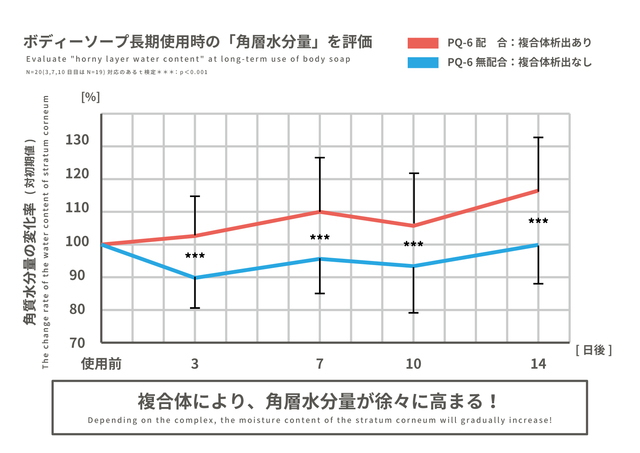 In the same survey, for the “Do you use body cream for moisturizing?” question, 69% people said ‘no’ and their reasons were “It is troublesome to apply it on your whole body” and “I’m too tired, I can’t apply it every day.” Although the body soap itself is required to have moisturizing effect, it is said that the conventional body soap is being washed out without leaving the moisturizing ingredients remains on the skin. Before we realize that, the soap’s ingredients are actually water bubbles. 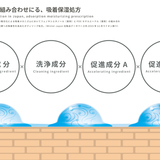 Therefore, during these 3 years, LION has implemented "adsorption moisturizing technology" that allows moisturizing ingredient to remain on the skin after being washed. LION’s “Hadakara” body soap was proudly born with this technology. In this way, the technology implemented by the laboratory has led to a hit product. But in reality, it still holds the possibility to be developed with various purpose other than solely moisture retention. Let's take a look at the characteristics of this technology once again. 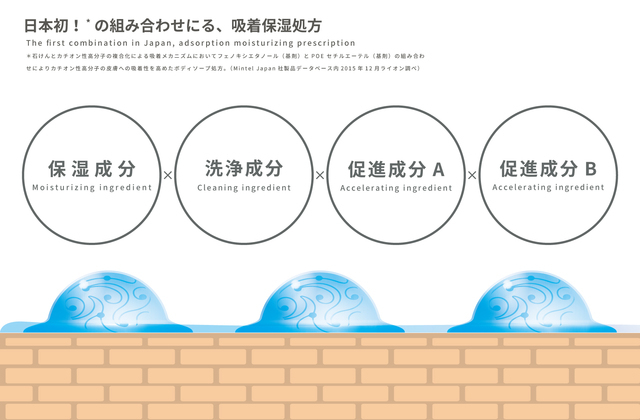 Cleaning liquid realized by Japan's first formulation consisting of cleaning ingredients and moisturizing ingredients PQ - 6 and two promoting ingredients, when mixed with water, changes moisturizing ingredients into a form that is easily adsorbed on the skin. When mixed with water, the moisturizing ingredients changes into a form that can be easily adsorbed by the skin (moisturizing component complex). Even when being rinsed, moisturizing ingredient will adhere to the skin, and will remain without being washed away. The real moisturizing effect can be realized. 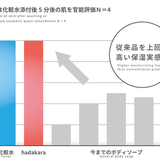 According to the experts’ evaluation, the skin bathed with “hadakara” was assessed to have the same feeling as applying lotion. This is a high moisturizing feeling that exceeds the conventional body soap. This adsorption technology gradually increases the moisture in stratum corneum moisture by keeping moisture ingredients on your skin. It does not only ease the daily maintenance of your skin every time you take a bath, but also keeps your skin moisturizing gradually as you continue to use it. It's a pleasant new formula for your skin. Although “hadakara” is a product born by utilizing this moisturizer-adsorbing technology, we know that the fragrance can be also made remain on the skin. Depends on the future development, it is possible to make other ingredients (such as bactericidal and anti-inflammatory ingredients) remain on the skin, and to make the users feel the effect after use. By all means, please propose a new product concept with reference to the following points of view. From the viewpoint of beauty, health, etc., what kind of effect do you want to leave on your skin? 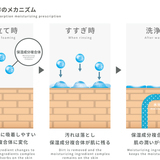 This technology promotes adsorption when in contact with water. So, what kind of occasions you will use something with water? Please think about it. By replacing another existing one with one using adsorption technology, convenience and added value of a completely new way of thinking may be born. Other points of view are greatly considered. We are waiting for your proposal from your own perspective. This time, we decided to invite new product concepts and designs utilizing this technology by borrowing your knowledge. When you are going to post the submission, please pay attention to these following details. What we are recruiting for this time is A COMPLETE PROPOSAL that includes product concepts including "the target customers", "what kind of needs" and "how to satisfy them" and even the design of product shapes, colors and packages. However, if the design is difficult, suggestions can be made only with the product concept part. Please be careful when posting the work so that you can take the following notes into consideration. This time, we are looking for products that can leave a certain kind of effect onto human’s skin (shampoo is not included). The goal of this initiative is to create hit products distributed all over the retail stores nationwide in Japan. It is still better if the package could show some newness, but be careful with the cost at the same time. The deadline for product concept and design recruitment is December 10th. We will position a certain period as a brush-up period from the end of the recruitment period. For those who are promising in posted works but have problems with feasibility, we may comment from here and ask you to do some brush up. Based on that, we will decide which design to be adopted and shift to product development phase. In addition, if you have any questions please write in the chat field. We look forward to your participation everyone! 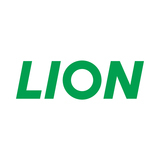 Questions received from the attendants at the briefing session held on October 16, October 25, and November 18 have been answered by Lion Corporation as below. Please definitely take these into consideration with your design! Q1: If there is no water, then PQ-6 cannot produce　complexes? 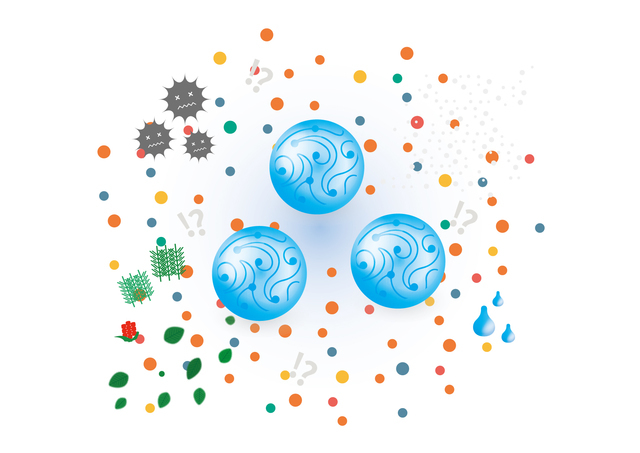 A: Moisture such as saliva, sweat, etc., anything is possible to form the complex. Q2: Are there restrictions such as losing ingredients due to passage of time after changing to a complex? A: The loss of adsorbing effect is affected by the water use to rinse, the passage of time does not play such an important role in this. Q3: Is it technically possible to increase the moisturizing effect of the complex? Q4: Is it no problem if the complex technology is swallowed? A: Because the complex is not attached very tightly, the composite falls even with rubbing clothes and the like. It remains in the skin for about 12 hours, we designed it to be reset every 24 hours. Q5: As the complex remained, can you peel off even if you scrub with a towel? Please tell me the conditions under which the complex falls. A: I think that it is difficult to return to the original status. Q7: Is it possible to mix water to make the complex from the beginning of making? A: Yes, that is possible. Q8: Does the ingredient change when it hits sunlight? A: LION produces clothes detergents such as "Akron" and "Hareta", so there are premises that the ingredients might be hit with the sun. Body soap and shampoo are not supposed to be used outdoors, but I think that properties do not change. It might be dangerous to expose to direct sunlight with product containing essential oil. Q9: Are there phenomena such as whitening when lotion or cream is applied after washing? What will happen if we apply lotion/toner onto the washed skin with such complex attached? A: Depending on the ingredients of the products you use, there might be different effect. Q10: If lotion is applied, will it penetrate less (because it is covered by the complex)? A: We think that’s possible to control. Q11: Does the moisturizing effect vary depending on the location of the body (face, hands, etc.)? A: Although it is a speculation, in the case of skin and hair, the nature of the surface is different, so the moisturizing effect and how the composite is attached does change. A: There are individual differences on the skin, and the effect of moisturizing also changes depending on the washing part · washing method. 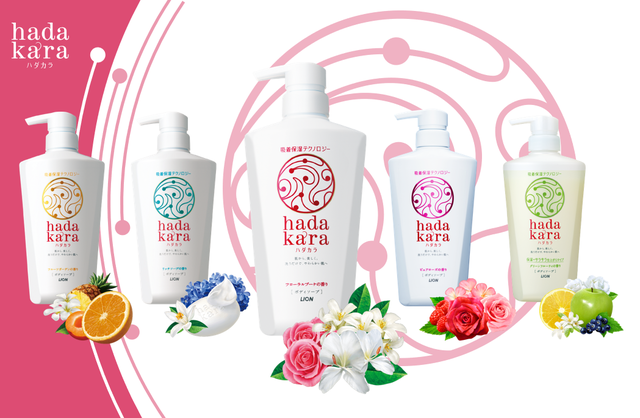 Q13: Is this recruitment only for hadakara's body soap? Is it OK with other products? A: Regarding the product, there is no limitation. Although shampoo is excluded, but if it’s a brand new concept of shampoo, it is welcome. Q14: Although it is possible to form complexes by reacting with water, can it be formed in the absence of water? A: Actually, the process of forming a complex is done through dilution. So it is difficult in the absence of water. Q15: How much water is required to form the complex? A: Regarding the amount of dilution, you can adjust for the ingredients. Q16: Would it react if we the water is not stirred? Does it react naturally if there is water? A: Although stirring could make the process faster, the complexes will gradually emerge if the ingredients are inserted in the water. Q17: Would the complex become transparent? A: You can change the opacity by modifying the size of particles of the complex. Making it transparent might be difficult since it is in a dissolved state. Submissions to this project are currently closed. LION and TRINUS will jointly commercialize, sell, and pay the following fee. ※ There are possibilities that multiple works may be adopted. ※ Maximum royalty is 3 million JPY per year, up to 5 years (15 million JPY). ※ Sales royalty will be the maximum value (0.5%) if all the product concepts and designs posted are adopted as they are. In the case of partial adoption, we will judge the degree of contribution and set the ratio. ※ Sales royalty is calculated by multiplying the manufacturer's wholesale price. We cannot promise the amount because it would be paid according to the sales amount. ※ Despite of being adopted in this competition, there is no guarantee to be distributed nationwide afterwards. - Submissions must be made via this website as image files (JPG, PNG or GIF). - Submissions can be in the form of a descriptive proposal, product plan, illustration, graphic image, photo of a trial product or a combination of the above (maximum 6 files). - Is not overly complex and can be manufactured and sold at a competitive/realistic price. ※ Please refer to terms and conditions as stated on our website. please reach us through Contact us.